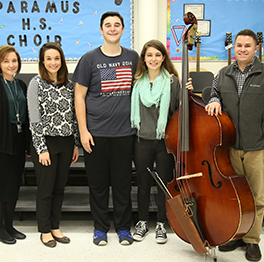 The Paramus Public School District has a long-standing history of appreciating, supporting, and valuing a quality arts education program. We believe that arts education is essential to a comprehensive high school program. The board of education has provided a deep level of support and commitment to the arts community, allowing the professional faculty to be creative and innovative, and to provide exceptional programs for our students. PHS offers an extensive variety of electives in the areas of music, art, dance, theater, industrial arts, family and consumer sciences, business, and the culinary arts. We offer several courses that provide the opportunity for dual enrollment for college credits. We operate on a rotating block schedule, allowing for longer periods of instructional time and greater flexibility in scheduling electives. This schedule is particularly well-suited to music, theater, and dance rehearsals as well as creation-based arts and music offerings. DECA is a co-curricular, student-centered organization geared for students preparing for careers in marketing, finance, hospitality, management, and entrepreneurship. Students compete on a regional, state, and international level for awards, scholarships, and personal recognition. By joining DECA, students gain the opportunities, resources, and support they need to become academically prepared, community oriented, and responsible professionals, as well as experienced leaders. From community service projects, competitive events, educational conferences, leadership positions, and networking and social media, students will attain the knowledge and skills they need to be college and career ready. To achieve the Mastery of Business Achievement certificate from Paramus High School, students need to successfully complete 15 business credits achieving an overall average of 3.0 or better. In addition, students must complete a portfolio, which includes a resume, a high school transcript, and one letter of recommendation. Students must also be actively involved in community service, internships, or DECA. PHS business education instructors review and approve MBA portfolios.